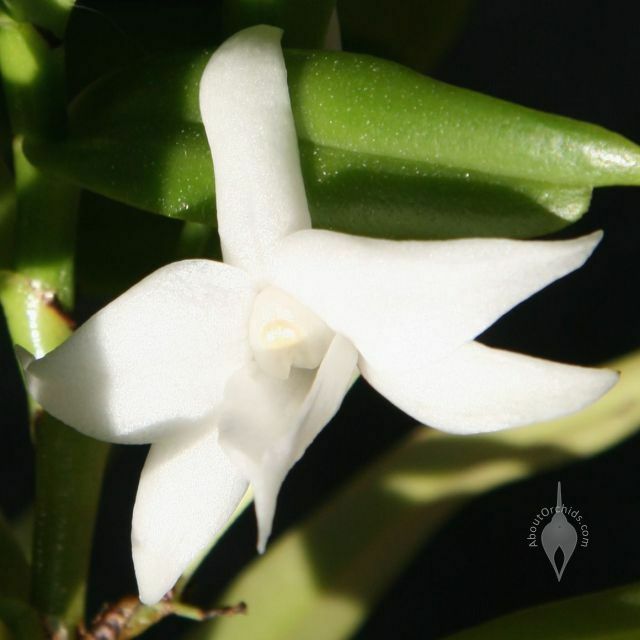 With spectacular white blooms and a sweet scent, this Angraecum offers an elegant display. This species is native to the Comoros Islands and Madagascar. 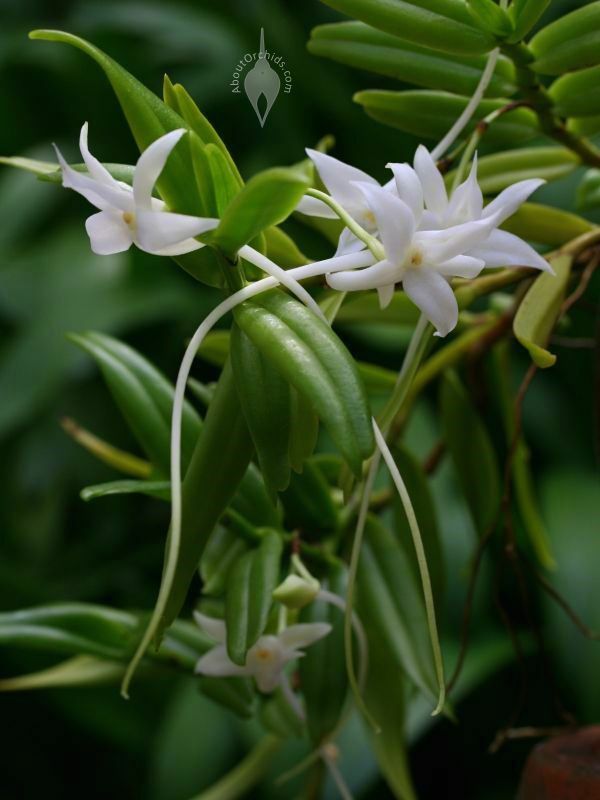 It’s easy to see its similarities with orchid relatives like Darwin’s Orchid, Jumellea, and Oeoniella. 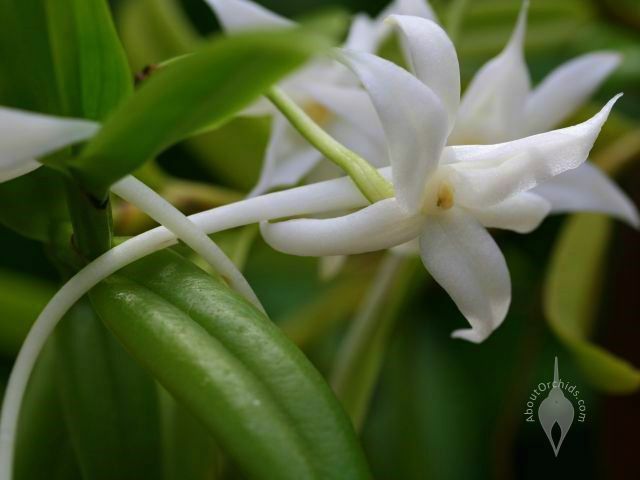 All have star-shaped white flowers, and produce rich fragrances at night to attract moth pollinators. 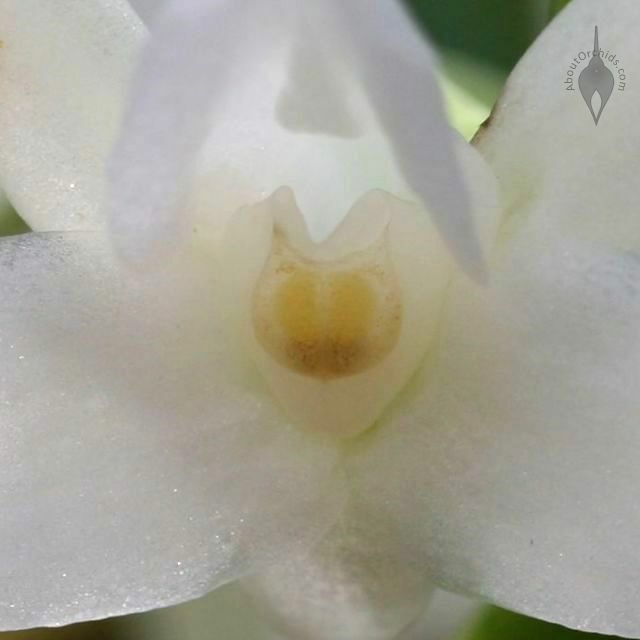 Those moth pollinators have long tongues, so the orchid completes its lure with a drop of nectar at the bottom of a narrow tube called a nectar spur. The flowers have evolved to entice the moth perfectly into position against the sticky yellow pollen. While the moth reaches to receive a nectar reward, it picks up or deposits pollen, and helps the orchid to reproduce. 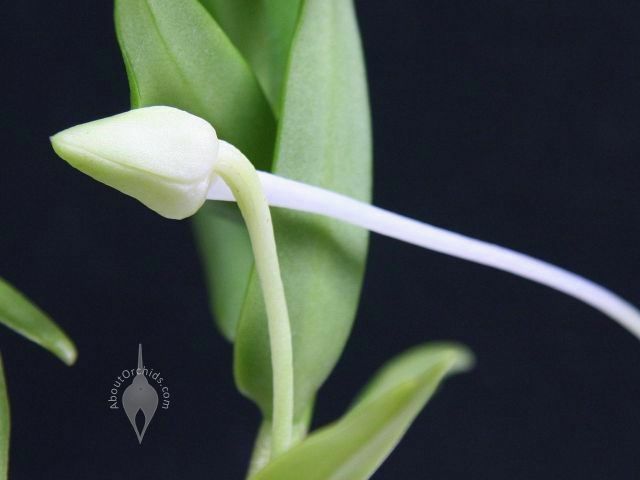 This Angraecum has a graceful nectar spur up to 4 inches (10 cm) long, more than twice the size of the flower itself. As they develop, the unopened flower buds are dwarfed by their lengthening spurs. Blooms can last a month or more. Like most of its tropical African relatives, this species requires bright light, warm temps, regular water, and high humidity. This entry was posted on Wednesday, May 26th, 2010 at 10:39 am	and is filed under Fragrant Orchids, Photos, Warm Growers. Do you grow all of these orchids yourself? The pcitures are very nice to see, but do you grow them or travel to find them? if you grow them yourself, you’re doing a wonderful job, because they all look so healthy! You must have a very nice greenhouse for all of these orchids. I wish I had a better place to grow orchids here in Florida. Would any of these grow outside here? I am near Miami. 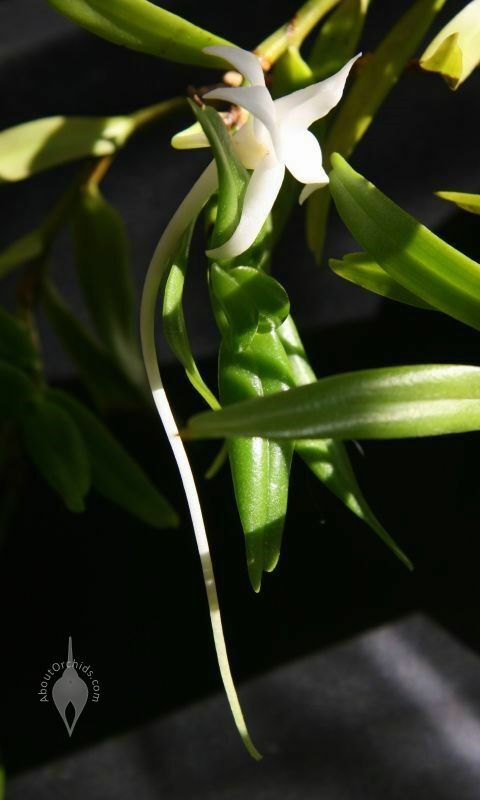 I grow many of the orchids in these pictures, including this Angraecum, but I don’t have a greenhouse (I wish!) Other pictures on this blog are taken by Dave or me at orchid shows, botanical gardens, and friends’ gardens. 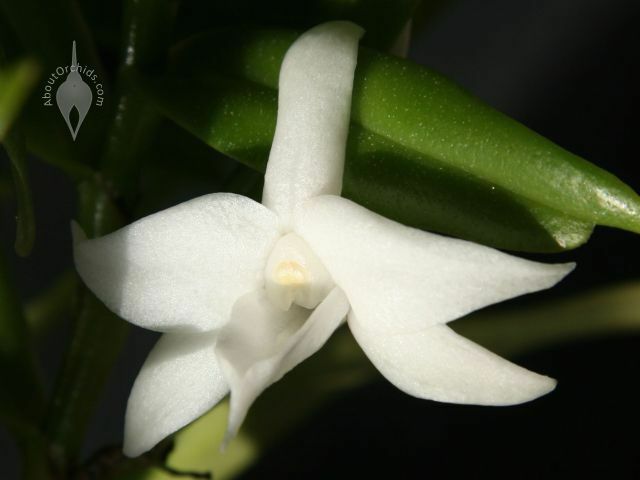 This species would probably do well in Miami, but is better suited for an experienced orchid grower. I would recommend starting with Phals, Cattleyas, Dendrobiums, Oncidiums, or Vandas. Some can grow outdoors all year in Miami, but others may need to come inside for winter. 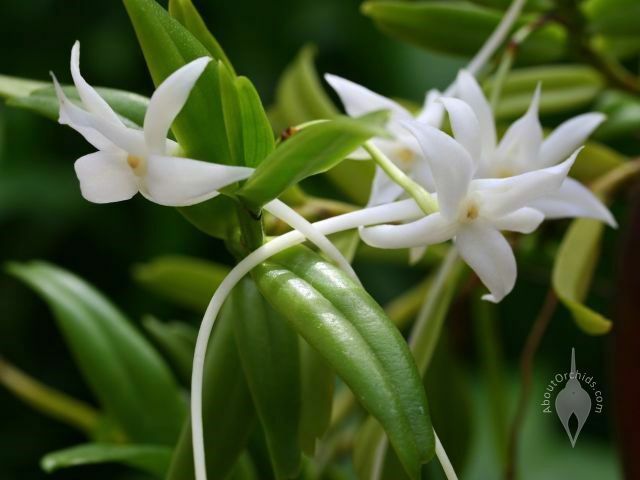 You’re lucky to be near the American Orchid Society HQ in Delray Beach. Check them out for expert info about growing orchids in your area, and visit their orchid gardens for inspiration. Thanks for the great photos!! Hey, wonderful blog! Keep up the good job! That’s really beautiful. I love the crystal pure white color. Thanks for the post.